DR 95 6676 (Borsig 10353/1919), originally built for HBE and named ‘Mammuth’, is the sole survivor of this type. Photo taken in Rübeland on May 11, 2008, by someone who wishes to be known as Wassen (source: www.commons.wikimedia.org). DRG 77 002 (later re-numbered 95 002), Borsig 11106/1922. Location and date unknown, most probably a factory photo. This locomotive remained in the DB service until March 1957. Photo from my collection. As many as five 950s have been preserved. 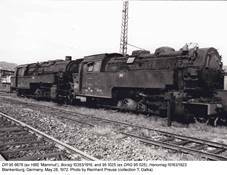 One of them is 95 0028-1 (ex 95 028, Hanomag 10181/1923). This photo was taken at the Bochum-Dahlhausen museum on September 19, 2010, by Henning Pietsch (source: www.commons.wikimedia.org). The sole preserved Polish TKz is TKz 211 (Borsig 14714/1938), on static display at the Railway Museum in Warsaw. This photo was taken on May 25, 2005. Relatively small coal box, at least for a locomotive of that size, is noteworthy. An unidentified locomotive of this type in service with sand railways. This photo was probably taken shortly before the war. I have found it at www.bagry60.republika.pl, but was unable to contact website administrator, so details are unknown to me. Any comment or hint is welcome. Development of 1-5-1 tank locomotives from Borsig; No.4 corresponds to TKz 206, No.5 – to TKz 207, No.6 – to TKz 208 through 211, No.8 – to TKz 224. Source: Baureihe 95 (see References). 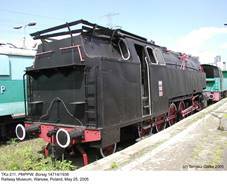 Among the heaviest and most powerful steam locomotives ever used in Poland were seven 1-5-1 tank engines, originally built for German sand railways in Upper Silesia. They were developed from Prussian class T20, of which 45 examples were built by Borsig and Hanomag between 1922 and 1924. Later they became DRG class 950, although first ten examples were initially numbered 77 001 through 010. Class T20 had in turn been based on four heavy tank engines, ordered by Halberstadt-Blankenburger Eisenbahn (HBE) from Borsig in 1917, but delivered only between 1919 and 1921 (later DRG class 9566). Sand railways needed powerful locomotives in order to fulfill growing demands for filling material that had to be transported from sand pits to collieries. This involved heavy drafts on tracks of often poor quality and steep gradients. First such engine was delivered to Sandbahngesellschaft des Grafen von Ballestrem of Peiskretscham (today Pyskowice) by Borsig in 1924 (s/n 11837). It was given service number 4 and named ‘Franz Pieler’. No.5 ‘Karl Euling’, also from Borsig (s/n 12117), followed in 1929. It differed in details and was heavier (axle load increased from 19.3 to 19.8 tonnes). Further four, of modified design and axle load increased to 20.4 tonnes, were delivered in 1935 (14588 and 14589), 1937 (14699) and 1938 (14714). They were numbered 6 through 9; No.6 was named ‘Nicolaus Graf Ballestrem’, the remaining three did not have individual names. In 1936 Borsig built another similar locomotive (s/n 14637) for Preussag Bergwerk- und Hütten-Verwaltung AG of Hindenburg O/S (today Zabrze). Numbered 8, it was slightly longer and heavier than those built for the Peiskretscham-based company. Second engine for Preussag was built by BMAG (10606/1936); numbered 9, it probably differed from No.8 in details, but its technical data are not known to me. Because of high axle load these engines were not allowed on DRG tracks. All these locomotives survived the war and, following the nationalization of coal industry, were taken over by newly-formed PMPPW (Przedsiębiorstwo Materiałów Podsadzkowych Przemysłu Węglowego – Filling Materials Enterprise of Coal Industry). Pyskowice-based engines were numbered TKz 206 (ex No.4), TKz 207 (ex No.5) and TKz 208 through 211 (ex Nos.6 through 9). 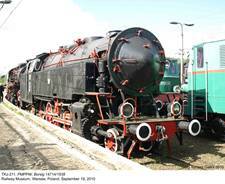 Zabrze-based No.8 and No.9 became TKz 224 and TKz 226, respectively. PMPPW service numbers were sometimes written with dash, as TKz-206 etc. Despite high tractive effort, double-heading was not uncommon, especially during winter, when sand was water-soaked and heavy. Due to large grate, fireman’s job was by no means an easy one. There were also complaints on poor access to certain elements, in particular lead truck centre-pin. Coal capacity of just 4.5 tonnes was too small for a large boiler and engines had to be coaled frequently. All locomotives of this type remained in use with PMPPW until early 1970s; later were transferred to collieries and served for a few more years as heavy switchers. The sole surviving example is TKz 211, transferred to the Sośnica colliery and finally withdrawn there in 1974. Refurbished at the ZNTK (Railway Stock Repair Works) of Bydgoszcz in 1985, it is currently on static display at the Railway Museum in Warsaw. 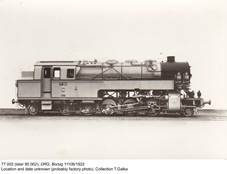 It should be noted that TKz 180 and TKz 181 were completely different locomotives, albeit also of the 1-5-1 axle arrangement. Patterned on the Austrian class 82, they were built by Fablok in 1928 (factory type T1B) and are described under a separate entry. ̶ Baureihe 95 by Wolfram Brozeit, Hans Müller and Günter Bölke (Transpress, 1990).